I had a review, as well as the interview all typed up. And then one of the worst things that can happen to a student and/or blogger happened. My computer died. It took weeks to fix, when I finally got it back I was scrambling to find all of my assignments that were due. It was several more weeks before I realized just how much I'd lost when my computer died. Including the author interview. I finally recovered it, and promptly forgot about it. (I'm sorry Angela, Sara and everyone else!) Then about 3 months ago I remembered (because I got an email from them...) and realized I needed to get it cleaned and ready to post to the blog. Then it happened again. My computer died. This time it took an even harder hit. I lost pretty much everything I had on my computer. It's a fixed and lovely now, working well with one of the best anti-virus systems my computer guy could find. Two weeks ago I was looking for an old paper I'd written that I wanted to reuse for another class, I found it along with (drum roll please) THE AUTHOR INTERVIEW! Unfortunately, it had been corrupted when the virus hit my computer, so I only have bits and pieces. What was an amazing interview, has turned into fragmented notes here and there left for me to interpret, trying to remember what it was I was talking about when I typed it. Kinda like going back and studying notes for an exam. However, the book and being able to talk to Angela was just too much fun not to share, so here is the interview along with my review. Scrambled as it might be. I've always been a sucker for time travel stories (hello Doctor Who). As I am sitting here typing this review I'm looking at my bookshelves and I can spot at least six of them that involve time travel. So when this book was offered to me, I was ecstatic. It was also the first time I'd been offered a book to review as a blogger that wasn't self published (nothing wrong with a self published book, of course). I got the book and my first impression? The cover was beautiful. I later found out why. 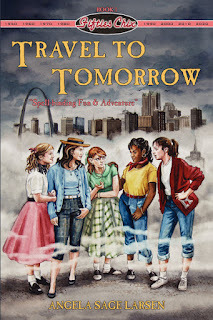 “n 1955 in the heartland of America, mismatched high school classmates Mary, Judy, Maxine, Beverly and Ann are assigned an intriguing social studies project by their eccentric teacher, Miss Boggs: they must predict what life will be like fifty-five years into the future. Little do they know that their grade is more than pass or fail; what they present to their teacher will turn their lives upside down. The day after the assignment, the girls mysteriously wake up in the very era they attempted to predict…and discover just how off-base they were. While venturing to solve the puzzle of their time travel predicament, they learn more about themselves and each other than they bargained for! Each Fifties Chix has a talisman that symbolizes a special talent that each one needs to navigate her new world and help them find the way back “home” to 1955. The characters are so very likeable. Some of them took me a chapter or two to really love, but all of them stole my heart by the time I was very far into the story. Each of them have unique personalities and traits about them that set them apart and give the reader more reasons to love them. Then there is the mystery. Why did they travel in time? How? Some things haven't changed... But everything else is so very different from the world they knew. The characters grow and change living in this new world, and it was so fun to watch them adapt, but never abandon their true selves. It is interesting to see their time period compared with our own. It highlights just how much has changed, the good and the bad. I feel like this is a rather vague review, but one of the delights of reading this book is I had no prior knowledge of the book. I didn't know what to expect. I would recommend this to anyone who enjoys time travel, friendship stories, or just a flat out fun read. It's classified as a Middle to YA level, so it's suitable for about any age. Although some of the references to the 50's might be lost on younger readers. There is a lovely section in the back of the book that defines some of the slang and cultural references used. As if I didn't gush about it enough above, I had a BLAST getting to talk to the author. Angela was a delight to talk to. I loved getting to hear about the writing process, we also had a few things in common and drifted off topic a few times, it was fantastic. I've been glancing through the notes and realized that some of the stuff could be spoilers, so I leave that stuff out but there is still some fun stuff to talk about. I also asked why she had picked the 50's, it's one of my favorite time periods so I was curious what inspired her to write about it. Angela did a lot of research for the book, there was so much detail in the story that it was obvious. When I asked she said it took an entire summer just for the research, she wanted it to be as authentic as possible. I asked if she had any favorite scenes, particular parts that she had enjoyed writing the most. She mentioned a few parts (that I can't say because it would be a spoiler, but they're wonderful moments) The scenes she mentioned are very character defining moments, as well as one rather powerful moment that happens early in the story. Another question I had was about the cover. Like I said before, I loved it. I would have bought the book just for the cover. She told me that an artist, and forgive me, I can't remember who it is, did the cover for her. He actually found girls that looked like the characters and used them as models for the cover. For the first time I read a book with the characters on the front and they actually looked like they were supposed to. I've lost most of the rest of the interview, but one last interesting thing. She and I were reading the same book at the same time. Actually, both of us have book ADD, in that we can't read just one book at a time. So while we were both reading multiple books at the time, we were both reading 'Shiver'. I was ridiculously pleased about that. Okay, here are some fun links for you sent to me by the lovely publishing company. Thanks, Mom. ;) Told you you'd like it. Thanks for the tip! I'll definitely have to check that out. Oh, this looks like heaps of fun! Thanks for the review, especially given the massive effort involved in getting it up there! It really is a fun read. Thanks so much for leaving a comment! I had never heard of this book before, but now I absolutely want to read it. It sounds like a lot of fun! Oh I love it when I review a book I truly enjoyed and it makes others want to read it!